London’s incoming asylum-seekers get a mixed reception, ranging from “refugees welcome” to “go back to where you came from”. A new book tells some poignant stories of arrival and re-homing. 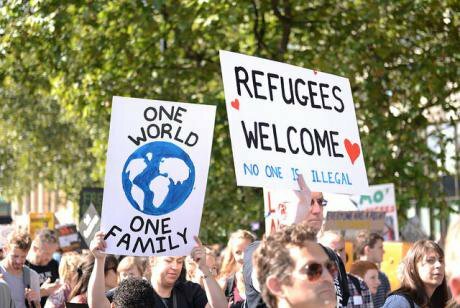 Image: Refugees Welcome demonstration, London, 2015. Ilias Bartolini/Flickr, Creative Commons. ‘London’ means many things to many people. It signals a governance problem to its administrators, a honey pot to its financiers, an open prison to its destitute. But to a lot of the world’s refugees, on dusty tracks, in camps and overcrowded boats en route from war, London is a destination, and its meaning is – hope. Hope of a renewed life, of re-homing, career chances, restoration of love after loss. Many, when they hire a people smuggler, tell him ‘take me to London’. But, as several stories in my book Looking to London make clear, handing over the cash is no guarantee that you will be taken to the destination of your choice. One of the women who told me her tale found herself first in Havana, not Heathrow. 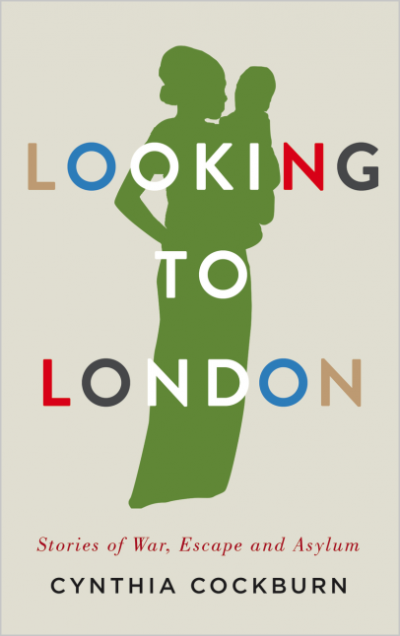 What I wanted to do in this book was biography - real-life accounts of Kurdish, Somali, Tamil, Sudanese and Syrian women finding asylum in London. But my standpoint is also autobiography - remembering my own arrival in the capital and what that moment meant in my life. I was born eighty-three years ago, into the deeply conservative middle class of the East Midlands, to a white English family in what was then an almost wholly white city. I travelled from Leicester to the capital in 1953, driven by my father in his Vauxhall Velox, down a road known then, ironically enough, as ‘the Great North Road’. I was a barely educated school-leaver, aspiring to clerical work in public service. Migration to London transformed my life. Once settled nine-to-five at a desk and typewriter, lodged in a hostel, I began to feel London the home it would remain. But as well as permanence, the city gave me perspective. First, on the past. As I discovered its historic neighbourhoods I came to understand them as having been created by waves of migration. Starting with the Romans in the first century CE, London has been settled, enlarged, enriched, embattled and embraced by one people after another. Then again, it brought into view a wider world. Beside me in the morning bus queue were newly disembarked migrants from the Caribbean ‘New Commonwealth’. Less visible, more habituated, were many from Ireland, Britain’s nearest and oldest colony. Before twenty years had passed, my particular locality, Camden, would be home to many Cypriots in flight from a bloody independence struggle. From all these incomers I learned what the UK had inflicted on their homelands: imperialism, wealth extraction, military control. These were the historic sources of poverty, oppression and conflict from which the new Londoners were in flight. This puts the present-day problematization of refugees into perspective. What becomes of interest is how the idea of controlling the flow of ‘outsiders’ across an ever more articulated and defended national border, and especially into the capital, became the preoccupation it is today. My book begins by tracking the development of immigration control from 1905, the year of the first Aliens Act, and proceeds to today’s efforts to deter asylum seekers and ‘disperse’ to locations far from London the ones who manage to penetrate the Border. If colonization is to blame for the desperate conditions in Afghanistan, Somalia, Sudan, Syria, Nigeria and other countries from which people are in flight, creating the ‘migration crisis’ in the Mediterranean these last few years - what responsibility does that place on European countries to receive and resettle them? The question is giving rise to fiercely conflictual British responses. On the one hand we have a warm and emphatic Refugees Welcome movement, led by Citizens UK. On the other we hear the clamour of ‘keep them out’ from the Right and its media. These political movements push and pull at London’s local authorities, faced with needy incomers in a context of austerity budget cuts, a dire housing shortage, packed schools and an under-funded health service. They’ve had to react, besides, to acts of terror. The government has given local councils and police the responsibility of ‘preventing’ political and religious radicalization, and for ensuring new arrivals can ‘integrate’ with existing communities so as not to destroy ‘cohesion’ in their localities. Framed within these ancient and modern realities, in Looking to London I tell the stories of five conflicts, their colonial origins and recent atrocities, and of women from each of these war zones, driven to abandon home and country, with or without family members, to seek safety in the UK. These individual women took me into community associations formed by the various migrant groups, and these in turn showed me how complex is ‘belonging’. I began to see that integration into a London locality need not mean abandoning one’s attachment to an ‘elsewhere’, now transnationalised. The Kurds of Turkey are a good example. The Turkish state maintains a position of denial concerning its many cultural minorities, including the large Kurdish-speaking population that lives mainly in the south-east region of Anatolia. A Turk is a Turk, for the Turkish State, and that’s that. The movement led by Abdullah Őcalan, for recognition and human rights for Kurds, became an armed struggle in the 1980s and flares into sporadic violence to this day. British immigration authorities are therefore inclined to recognize that Kurds in flight from Turkey have a genuine case for asylum. Yet the PKK (Kurdistan Workers’ Party), supported by many of the Kurdish women Londoners I met, is proscribed not only by Turkey but by many other states including the UK, as a ‘terrorist organization’. So if a Kurdish asylum-seeker in Britain continues to be active for Kurdish rights she will be subject to the scrutiny of the security services. The situation is made more complex by the fact that in the Middle Eastern wars today Kurdish groups oppose not only the Turkish government but also its enemy, the Syrian regime, and (besides) ISIS (Da’esh). For good measure, they are themselves treated one day as friend, the next as enemy, by the USA. Kurdish women in London have, for all this, found an incontrovertibly legitimate way to remain engaged: by being active as women, for women, and against violence. Roj Women’s Association, as the principal group know themselves, lent energetic support to the rescue by Kurdish women’s armed groups in Iraq of the hundreds of Yezidi women held prisoner and subjected to sexual slavery by Da’esh. More recently, seeking engagement with non-Kurdish women’s organizations in London, they have formed a Women’s Alliance for the Defence of Women in Kurdistan, Iraq and Syria. Now, on the Million Women Rise march to Trafalgar Square on International Women’s Day, my own organization Women in Black against War find ourselves shoulder to shoulder with Kurdish sisters – and migrant feminist groups from many other countries too. That, for me, is integration, and makes me glad to be a Londoner.